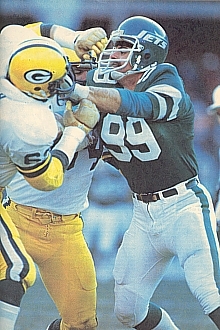 Gastineau transferred from Arizona State to East Central Oklahoma State and was credited with 27 sacks and 200 tackles in two seasons, garnering NAIA All-American honors in 1978. He was chosen by the Jets in the second round of the ’79 NFL draft and, a raw talent, was primarily a reserve member of a young defensive line as a rookie. Gastineau moved into the starting lineup in 1980 and was unofficially credited with 11.5 sacks. The unofficial sack total rose to 20 in ’81. His teammate, DE Joe Klecko, had 20.5 and overall the Jets recorded 66 sacks in easily leading the NFL. The defensive line, which also included tackles Marty Lyons and Abdul Salaam, was christened “the New York Sack Exchange” and Gastineau was selected to the Pro Bowl as well as receiving first-team All-AFC honors. Individual sacks became an official statistic in 1982. Jets went 6-3 in the strike-shortened season and were sixth seed in the AFC playoff tournament that replaced the usual postseason format. Won First Round playoff over Cincinnati Bengals (44-17) & Second Round playoff over Los Angeles Raiders (17-14). Lost AFC Championship to Miami Dolphins (14-0). Known for his flamboyant sack celebrations, Gastineau followed up by leading the NFL in each of the next two seasons, with 19 sacks in 1983 and 22 in ’84, a record that stood until 2001. He again received first-team All-NFL and Pro Bowl recognition in each of those seasons. Hobbled by injuries in 1985, Gastineau still accumulated 13.5 sacks and was chosen to a fifth straight Pro Bowl. He missed six games due to injuries in 1986, accumulated only 4.5 sacks in ’87, and after getting off to a strong start in 1988, abruptly retired halfway through the year. An abortive comeback with the British Columbia Lions of the CFL ended after four games of the 1990 season. Overall in the NFL, Gastineau officially accumulated 74 sacks. He was a consensus first-team All-NFL choice twice, received at least some first- or second-team honors after three other seasons, and was selected to five Pro Bowls.